The Fourth Industrial Revolution has come, and no industry will remain as it was. Building on previous revolutions – steam, electricity, and information technology – the fourth revolution is where technology begins to integrate with the physical and biological, becoming more deeply intertwined in our lives. The ways that we communicate (through Facebook), travel (via Uber), and shop (definitely on Amazon) have already transformed, just to name a few. In other areas, things seem stuck. The experience of dealing with an illness or visiting a doctor hasn’t changed much in thirty years. But it will. Health care, even with its vast infrastructure and web of regulations, will not escape the digital revolution and patients will benefit. So get ready to navigate a new path in your own health journey. The ways that we communicate (through Facebook), travel (via Uber), and shop (definitely on Amazon) have already transformed, just to name a few. In other areas, things seem stuck. The experience of dealing with an illness or visiting a doctor hasn’t changed much in thirty years. But it will. Health care, even with its vast infrastructure and web of regulations, will not escape the digital revolution and patients will benefit. So get ready to navigate a new path in your own health journey. When reflecting on how industries are transforming, two major shifts stand out. The first is the proliferation of digital technologies that are spanning the gap between physical and virtual worlds. Open platforms, served up through apps on our ubiquitous mobile devices let us do everything quickly and conveniently – from selling our stuff to scheduling a repairman. The second shift is the business model. Enabled by technology, companies are moving from company/provider-centric to customer/user-centric. As users become accustomed to the convenience of these new business models, even the most intractable industries will need to evolve their offerings. Unfortunately, health care has a long way to go. 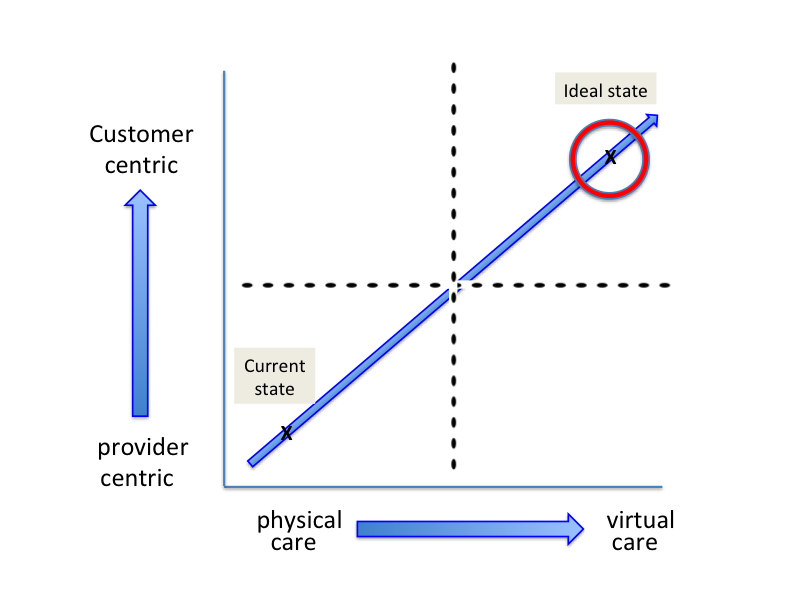 The current state of health care seems intractably positioned in the provider-centric, physical care quadrant. Case in point: as busy providers of musculoskeletal care, two of the authors typically see 40 to 50 patients per day. We require these patients to come on-premise for an appointment. Patients might wait weeks or even months for the visit, and are obliged take time away from their busy lives to fit into our schedules. Once they arrive on site, they wait. They wait in the waiting room, wait in the examination room, wait for the x-rays, and wait for the doctor (often multiple times). Most of these patients present with common orthopedic conditions and will receive routine treatments that are provided off-site, such as physical therapy. The majority do not need major interventions such as surgery, and could indeed be cared for virtually given the right technological support. Once they arrive on site, they wait. They wait in the waiting room, wait in the examination room, wait for the x-rays, and wait for the doctor (often multiple times). Most of these patients present with common orthopedic conditions and will receive routine treatments that are provided off-site, such as physical therapy. The majority do not need major interventions such as surgery, and could indeed be cared for virtually given the right technological support. This care simply couldn’t be classified as “customer-centric,” and very little in the health care management process is. Patients struggle to access their health records, clarify their insurance coverage, coordinate care between specialists, and even truly understand their medical conditions and treatment options. Many of the most important steps one can take in managing health are preventative, and yet people rarely receive support and advice until there is a problem. Digital platform PatientsLikeMe allows those with medical conditions like Parkinson’s or depression to connect with others, share their experiences, and better understand their treatment options and outcomes. At Brigham and Women’s Hospital (BWH) in Boston, patients with specific chronic diseases who require frequent visits (e.g. gestational diabetes) are now able to have video-based rather than in-person doctor appointments. After 600 virtual visits, BWH has calculated that doctors saved 200 hours. Further, 94% of patients surveyed were satisfied with the program and 74% felt that their relationship with their providers was improved. A variety of platforms, mostly local at this point, are connecting patients with doctors willing to do home visits on short notice, including Heal, Family Health on Call, and Pager. A virtual approach has had strong growth in the mental health realm, including iCouch and Talkspace. MotherKnows will track and maintain your child’s health records electronically, including immunizations, growth charts, and health events, a boon for any parent navigating a new school or daycare. New devices are coming out to help people manage their health at home and some can even send information to your doctor. While we’re all familiar with Fitbits and other activity monitors, now there are heart monitors, blood pressure checkers, posture monitors, and smart scales. There are now more tools than ever, for each of us to take control of our health care. To better understand our health, to find the best providers to help us, and to manage our treatment. The truth is no one, with the possible exception of your mother, will ever care as much about your health as you do. Change your team to ensure that you have the digitally savvy members, from board to front office, to help you navigate this change. Each of us has a role to play, whether empowered patient or forward-looking provider. Health care is not unique and will not be the only “undigitized” industry in ten years. If it doesn’t change from within, startups and major players (Google, Microsoft, Apple) will step in and bring health care into the digital age. This piece was coauthored with Megan Beck, Chief Insights Officer at OpenMatters, Steven F. Schutzer, M.D., Medical Director, Connecticut Joint Replacement Institute (CJRI); President, Connecticut Joint Replacement Surgeons, LLC, and John C. Grady-Benson, M.D. Medical Director, Center for Outcomes Research, CJRI.